Coppell High School junior Mic Weathers defends the ball during the first half of Tuesday nights home game at Buddy Echols Field. The varsity girls soccer team played against WT White taking the win with a score of 5-1. 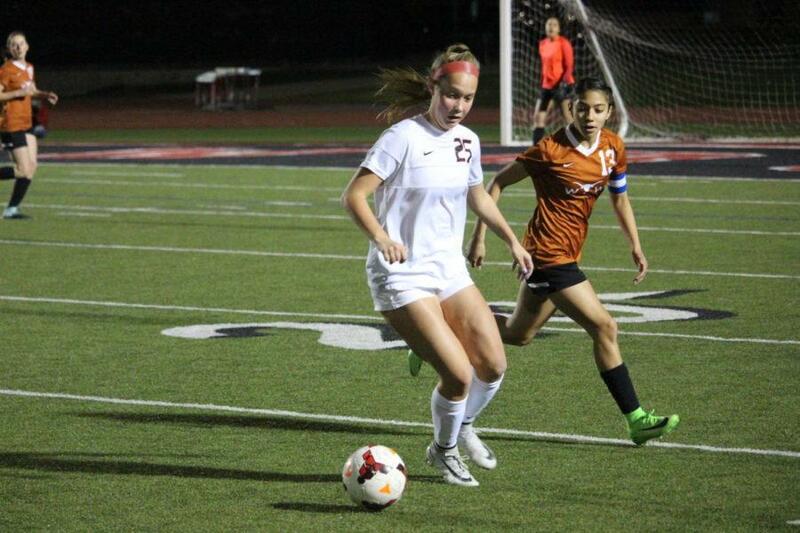 Firmly sitting in second place in District 9-6A, the Coppell girls soccer team defeated W.T. White, 5-1, on Tuesday at Buddy Echols Field to remain in contention for the district championship. The match broke a tie for second place in district. The Cowgirls, playing the regular 4-3-3, controlled a majority of the possession and effectively kept the ball on the opposition’s side. The midfield played a big part in the Cowgirls victory, with its well-timed passes, creative plays and turnarounds leading to many crucial moments in the match. The offense also performed well with quick passing and creative runs in the third half. The match opened up seeing heavy attacks from the Cowgirls in the first 15 minutes, along with a crossbar and some shots on target. Coppell High School sophomore Montserrat Lomeli makes a pass during the first half of Tuesday nights home game at Buddy Echols Field. The varsity girls soccer team played against WT White taking the win with a score of 5-1. 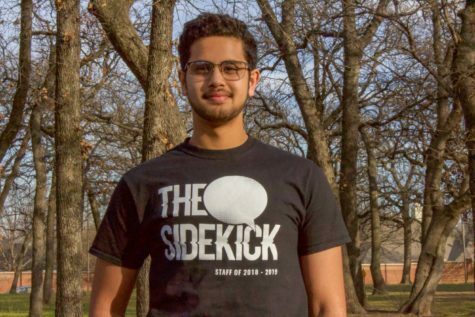 Coppell sophomore center-back Monste Lomeli gave the match its first goal with a tap-in shot on a rebound off her missed penalty in the 19th minute. Freshmen midfielder Maya Ozymy also scored with a header off a cross in the 23′, making the score 2-0. However, the Lady Longhorns got back on their feet with a well-played header by junior midfielder Alliyah Marquez, making the score 2-1 in the 22nd minute. But their hopes were diminished with a great and quick play by the Cowgirls, which lead to a goal by junior forward Micayla Weathers in the 29th minute, once again giving the Cowgirls a two-goal lead. Weathers hit the back of the net twice more in the eighth and very last minute of the game, resulting in a much-earned hattrick. One of the rather noticeable players on the turf yesterday was Weathers, who played a critical part in the victory. 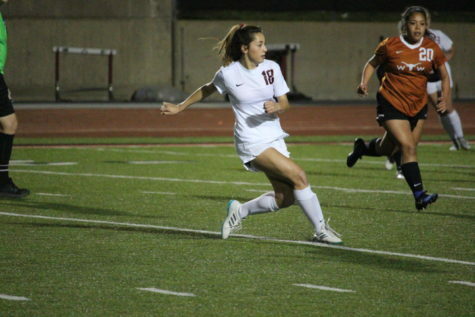 Not only did she score a hattrick against the Lady Longhorns, Weathers was one of the driving forces in the Cowgirls attack with her vision and accurate passing. 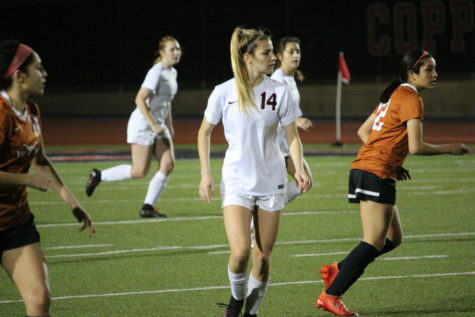 District leading J.J. Pearce (7-1-0) are on a six-match win streak and has two matches remaining, whereas the Cowgirls (6-1-1) have three matches left to play. Coppell High School senior Addison Ramirez watches the ball during the first half of Tuesday nights home game at Buddy Echols Field. The varsity girls soccer team played against WT White taking the win with a score of 5-1. Be sure to catch Coppell playing at Berkner at 7:30 p.m in Richardson on Friday.